Following the French atomic bomb tests in the South Pacific, an unknown creature is spotted passing eastward through the Panama Canal. 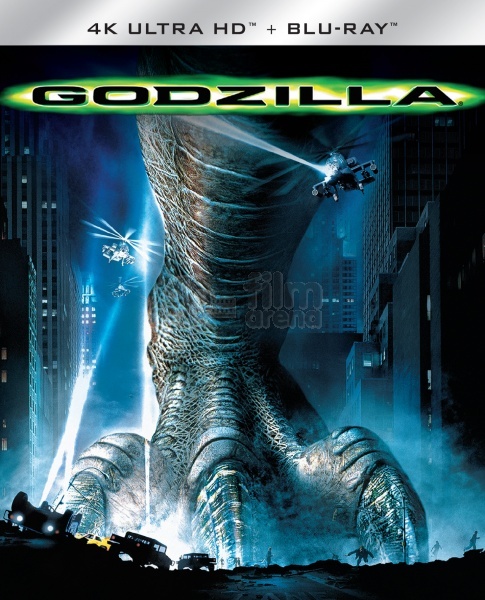 Scientist Niko Tatopolous is called in to investigate the matter, and he quickly arrives at the conclusion that a giant, irradiated lizard has been created by the explosions. Godzilla then makes its way north, landing at Manhattan to begin wreaking havoc in the big city. Even with the combined forces of the U.S. military to fight the monster, will it be enough to save the people of New York? The movie starts with a reel showing nuclear tests on the island of French Polynesia. It shows some lizards on the island and after a huge explosion, we see a single unhatched egg. On a fishing boat in the South Pacific Ocean workers are sorting the fish in their latest catch and the captain sees a weird mark on the radar headed towards the boat. He sounds the alarm and the boat is hit by a large & mostly unseen beast. The monster proceeds to rip giant holes in the boat, which is capsized. Scientist Niko "Nick" Tatopoulous (Matthew Broderick) is collecting earthworms in Chernobyl, Ukraine for study when a helicopter appears and a man from the U. S. State Department tells him hes being reassigned to a different project. In Tahiti, a mysterious French man is interrogating an old man who was the only survivor of the attack on the Japanese fishing boat. When asked what attacked him, he simply replies "Gojira". Nick then arrives in Panama where Colonel Hicks (Kevin Dunn) briefs him on his next assignment. He leads him to his next sample and tells him to study it. Nick doesn't see the sample until he realizes he is in a depression in the ground that is actually a giant footprint. Nick runs after Hicks and starts telling him that its unbelievable and that nothing on earth can make a footprint that big. He is then introduced to his new boss, Elsie (Vicki Lewis), who says that she tried tell Hicks that this project isn't really in Nick's field of study. She seems to take interest in Nick. Then Dr. Craven (Malcome Danare) shows up and puts on a tape showing the shipwreck and the interrogation of the old man. In New York City, Audrey (Maria Pitillo) is getting out of a cab with groceries for her boss and goes upstairs to the news studio. After putting the groceries down she asks her boss, Caiman (Harry Shearer) for a job as a reporter and not an assistant. He says no and goes to his anchor job. Audrey then puts her gum on the nose of a nearby poster of Caiman. Nick and the team have been flown to Jamaica and while in a car ride to the site of another shipwreck, Elsie asks Nick some questions. We learn that he is a radiation scientist studying the abnormal growth of earthworms due to radiation, and that he had a girlfriend a long time ago. At the shipwreck, Hicks is trying to shoo reporters away when the French man who interrogated the crew member shows up and says that they are with him and are preparing a report. Hicks get rid of them eventually. Down on the beach, Nick takes a sample of what looks like fish guts for study. In the ocean on the Eastern seaboard, 3 fishing trawlers are bringing in a day's catch when the nets seem to get stuck on something. The boats then are towed underwater and all members of crew abandon ship. One of the trawlers comes back up upside-down. Hicks and team hear the report about the fishing trawlers while flying back to America and Nick then concludes that it is a new species created by the nuclear tests in the French Polynesia where it was first sighted. Back in New York, Audrey and her friend Lucy (Arabella Field) and Lucy's husband Victor "Animal" (Hank Azaria) are having dinner at a restaurant when Audrey sees Nick on TV. We learn that Audrey is Nick's old girlfriend and that he had asked her to marry him. She'd turned him down and he'd left her. Down at the docks a man is fishing when his line is taken by a huge fish. The beast that attacked the fishing boats surfaces and destroys the dock and proceeds into the city. When it passes the restaurant, Animal chases it with a news camera and manages to get a small video of it near Grand Central Station. The monster continues to stomp through the city -- it's foot nearly crushes Animal. Elsewhere down the street, Mayor Ebert (Michael Lerner) is giving a speech for re-election when the monster storms through the street. Hicks arrives at the city and asks for a status report, Sgt. O'Neal (Doug Savant) reports that the monster has disappeared. Hicks is incredulous, wondering how an animal that big could disappear so easily in Manhattan. Animal's video is broadcast on TV and while handing Caiman his bag, Audrey steals his ID badge. She then replaces Caiman's picture with her own and makes herself a reporter. The French man shows up again and we learn that his name is Phillipe Roache (Jean Reno). He offers the assistance of a special sector of the French government to the mayor while slyly placing a microphone on the back of his jacket collar. The mayor then goes to a meeting with Hicks and the crew with Roache and his team listening in when O'Neal says that finding the monster may be tough since they found the 23rd street subway station destroyed. The beast had burrowed his way through the tunnel and could be anywhere under the city. Hicks then tells O'Neal to block off every tunnel leaving the island effectively quarantining the island. Nick then suggests bringing the monster out with bait. The bait is a large pile of fish set up near Madison Square Park. One of Roache's gang plants video cameras so they can spy on the American authorities. When one of the team says that the fish trap is crazy, Roache replies "No. Very Clever." The trap works and Godzilla arrives and starts eating the fish. The Army opens fire. While being fired upon, the monster escapes and proceeds to run through the city with three helicopters in pursuit. Their missile strikes are ineffective because the monster is cold-blooded and doesn't give off a heat signature for the missiles to lock onto. After a missile strike intended for the monster knocks the top off of the Chrysler Building the copters switch to miniguns with ineffective results. The beast then turns from the hunted to the hunter, destroying the helicopters. He then disappears. Back at the intersection, Nick takes a blood sample found on the street and then is transported to New Jersey. He enters a shop and buys about five different pregnancy tests when Audrey walks in and we learn the secret to the past. They then go back to Nick's tent where Nick finds out that the monster is pregnant from the blood sample and goes to confirm it. Audrey plays a tape saying TOP SECRET on it and then takes it and leaves. At a meeting we see the leaders planning to draw the beast out again this time to a more open area like Central Park when Nick presents his theory of the creature being pregnant and tries to get the others to believe him. Audrey prepares her report with the tape she stole. Her report goes live after being stolen by Caiman (who dubs the beast "Godzilla", a mispronunciation of "Gojira" from the tape Audrey stole) and Nick is fired for going to the press with his ideas even though he hadn't. He then realizes that Audrey took the tape. After hearing this, Roache plans to leave. While Nick packs up Elsie apologizes and Nick tells her to get Hicks to find the nest. While climbing into a taxi, Audrey shows up and tries to apologize, but Nick blows it off. He tells the driver to go to Newark Airport but the drivers locks the doors and drives a different way. Animal follows in a van. When Nick finally gets the driver to stop, Roache turns around and explains the situation. He is part of the French Secret Service and his mission is to protect his country from their own creation. Nick then figures out that Godzilla was created in the French Polynesia during the nuclear testing just like he thought. Nick agrees to help Roache find the nest because Hicks doesn't want to find it. Roache drives them to a base where they prep to enter the city and Animal watches from a hole in the wall. Animal then returns home where he finds Audrey crying because she believes that Hicks not going for the nest is her fault. Animal then convinces her to help him follow Nick and Roache to find the nest. Nick and Roache's team sneak back into the city disguised as soldiers. In Central Park, Hicks has set another trap. 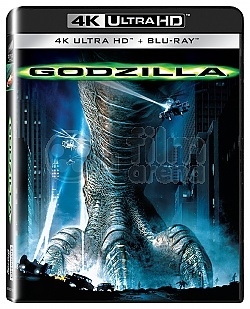 While traveling down a wrecked subway, Animal sets off a huge noise that awakens Godzilla and sends him to open air. He then proceeds towards the fish trap but turns away. The army starts firing and Godzilla runs to the river. 3 subs are waiting for him. After dodging 2 torpedoes Godzilla crashes into one of the subs and the torpedoes destroy while following him. Godzilla then goes back towards land and is knocked out, but thought killed by two more torpedoes. Nick and the team then discover that Godzilla has made his nest inside Madison Square Garden (MSG). They discover only 200 eggs which begin hatching. They then decide that they have to run immediately or become food. In another part of MSG, Audrey and Animal escape into the shower room and then proceed up into the vent. While shutting all the doors to lock them in the arena 2 of Roache's 4 man team are killed by the babies. Nick tries to call the military to send a bomber but all the circuits are busy. Roache then tells him to get out and find help while his team holds them off. Nick cant get out and the last 2 members of Roache's team are killed. Roache and Nick are trying to think of a way to contact the military when Audrey and Animal fall out of the vent. The babies then break the door down just as Audrey comes up with an idea to get a message out. They manage to get to the broadcast booth and send a message out through live TV. The Military gets the message and tells them via e-mail that they have less than 6 minutes to get out. They make it to the lobby with 30 sec. to go but the lobby is jam packed with the babies. Roache then finds a way through and gets them out just before F-18s destroy the building. All the babies are killed. After that Audrey and Nick get back together but before they can say anything else Godzilla rises from the ruins. He sniffs one of the dead babies then glares at Nick and the others. They immediately run away to a taxi and drive away with Godzilla chasing them. Nick then throws the cab ID to O'Neal whose caravan is passing by. O'Neal figures out that he can use the cab ID to find the radio frequency to contact Nick. Meanwhile, Nick and the others get stuck in a tunnel with Godzilla trying to get them out. O'Neal contacts them and Nick comes up with a plan to trap Godzilla in the suspension cables of the Brooklyn Bridge. They get Godzilla onto the bridge after a terrifying incident in his mouth and proceed to get him caught. Then the same F-18s that blew up MSG came and each shot Godzilla 4 times for a total of 12 hits. Godzilla then dies landing on top of the taxi. While the city celebrates, Caiman offers a job to Audrey because then his channel would get the exclusive, but she quits. Animal realizes that the tape he had brought to film the entire event is gone. Roache disappears, but calls Nick from a phone booth telling him goodbye and that he will send the tape after he makes a few adjustments to it. Nick then tells Animal this after Roache hangs up and Animal is furious. In MSG, basketballs and towels are burning and there is fire everywhere. One egg is still unhatched and the baby hatches and roars at the camera.